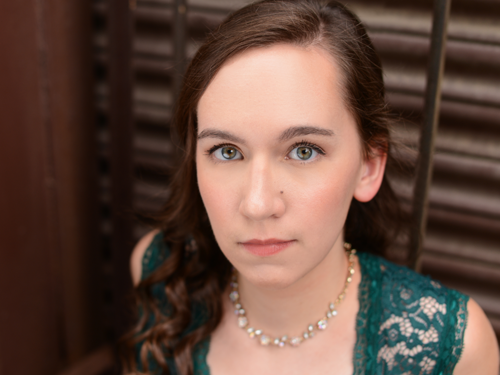 Katie Procell studied with voice Phyllis Bryn-Julson at Peabody Conservatory (MM 2018) and at James Madison University with Kevin McMillan where she founded its Gilbert and Sullivan Society (BM 2016). Past opera credits include Susanna (Le nozze di Figaro; Peabody); Giulietta (I Capuleti e i Montecchi, Opera Alchemy); Krysia (understudy, Out of Darkness: Two Remain, Baltimore Theatre Project); Celia (Iolanthe; Young Victorian Theatre Company); Rosina (Il barbiere di Siviglia; JMU); Valencienne (The Merry Widow; JMU); Phyllis (Iolanthe; Luray Opera Theater); Patience (Patience; JMU); Despina (Così fan tutte; Luray). She loves the avant-garde and has performed Pierrot Lunaire, Toch’s Edgar and Emily, Messiaen’s Harawi, Berio Sequenza III, Kurtàg’s Attila Fragments, and even Walton’s Façade. She works closely with composer Peter Dayton and has premiered several of his works, including All in the Sound, If They Delight, and The Need of Comrades. She currently serves as production manager for Opera Alchemy. She has trained at Oberlin Baroque Performance Institute, Halifax Summer Opera Festival, Centre for Opera Studies in Italy, and SongFest. She has been playing the cello for fourteen years and has played with the JMU Chamber and Symphony Orchestras and with the Monticello Quartet.